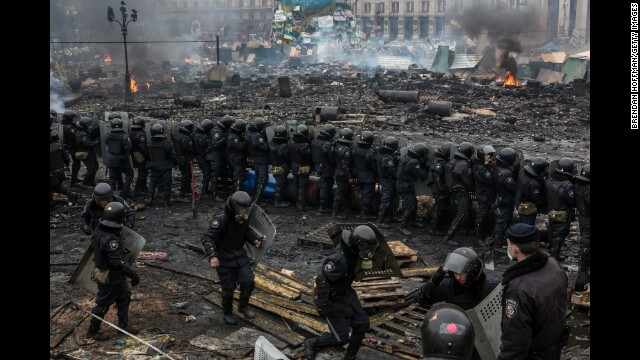 As the United States puts the finishing touches on possible sanctions against Ukraine, senior Obama administration officials tell CNN they are bracing for the government to intensify its crackdown against anti-government protestors under pressure from Russia. The officials describe an escalating situation on the ground with both Ukraine and Russia branding the protestors as terrorists. That would suggest the Ukrainian government is planning to impose a state of emergency, giving the military extraordinary powers to further the crackdown. "Things have gotten very bad," one official said. "The government is speaking in very nasty, aggressive and confrontational terms. It signals they are prepared to do something." The officials said there was progress over the past week for a political solution, but things soured in recent days since President Viktor Yanukovych met with President Vladimir Putin in Sochi. "Yanukovych turned away since that meeting with Putin in Sochi a few days ago," the official said, adding the Russians have also started buying Ukrainian bonds. "We can't prove causality, but you have to wonder" about Russian influence on Yanukovych, the official said. The officials pointed to Yanukovych's firing of Col. Gen. Volodymyr Zamana, the head of the armed forces and someone considered pro-Western, as a bad sign. Demonstrators are now occupying some government buildings in some western Ukrainian cities where authorities are considered more sympathetic to the opposition, which the officials also said is a telling sign that things are looking bad for the government. "From the Russian point of view, this is getting out of control," another official said. "It feels like we are headed for a confrontation. I wouldn't be surprised if it got much worse." Meanwhile, the administration is putting the finishing touches on possible new sanctions against the government, official said. The administration has been preparing possible sanctions against the regime since early December, when the government crackdown against protesters began. Senior U.S. officials said visas were revoked in January for Ukrainian government officials linked to the violence against protestors. The officials said the administration is putting the final touches on a presidential executive order imposing sanctions against those involved in the crackdown. President Barack Obama would still need to sign off on any new sanctions. The interagency process on sanctions was described by the second official as "very advanced." "We are in a position to move relatively quickly on this. It is a question of days, not weeks," the official said. "Given what has happened, it would take a change for the better to slow or stop this." The European Union is also discussing possible sanctions, with Sweden, Poland and Germany all speaking favorably in terms of imposing sanctions. A balanced approach is imperative jointly by US plus Europe.Sanctions will indirectly hurt Ukriane people. The Ukrainians just won a Gold medal for their country! Ah yes, definitely push the Ukraine Pres into the arms of the Russians who will send temporary security forces to protect ethnic Russians, as happened in Georgia. Who the he^^ are we Americans to interfere in this crisis in the Ukraine? What we need to do is to get our people out of there and let things take their course. Hopefully, Yanukovitch will come out on top as the alternative is too terrible to mention.